Frenchy and the Punk returns to the New Deal Cafe on the 'Hooray Beret' Tour 2019!! New Album, New Songs, Old Favs! Frenchy and the Punk is an eclectic genre-bending internationally touring cabaret rock duo based in New York. 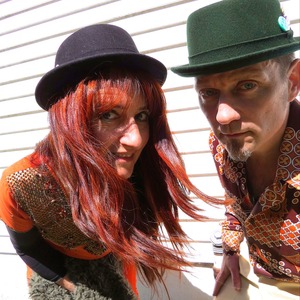 Formed by bi-lingual French-born singer Samantha Stephenson and live looping guitarist and veteran of the punk scene Scott Helland (Deep Wound/Outpatients), their sound is an eclectic mix of dark cabaret & indie rock. Helland's signature rhythmic and melodic guitar looping style creates a driving and expansive sonic landscape that perfectly blends with Stephenson's powerful vocals and percussion. They were named one of the ''Top 25 Dynamic Duos in America” by Yahoo Music and have performed all across the U.S. and in Europe. Their show is a carnival of two that will take you from the Moulin Rouge to CBGBs and back again. A rollicking cabaret rock show with Taiko meets Rio de Janeiro pounding drum instrumentals. Fun with a capital F! Think Florence and the Machine, PJ Harvey, Siouxsie Sioux, Dresden Dolls.